Siddarth Kaul was instrumental in reducing Mumbai Indians to 65/5 at Hyderabad, a surface where the Sunrisers had racked up 200-plus scores twice in succession. After an ordinary start to the season, Kaul turned up on Saturday to derail Mumbai's innings. The Sunrisers seamer took just two balls to strike as he sent back a well-set Quinton de Kock in the ninth over of the innings. Kaul pushed in the knuckle ball to confuse de Kock and the southpaw miscued his slog to the deep fielder. Kaul struck again in his next over when he had Krunal Pandya with a sharp bumper that the all-rounder top-edged to the keeper. Mixing up his length and pace, Kaul seemed pretty much in control for the first time this season in his first three overs that went for just 14. However, his efforts unravelled as Kieron Pollard dug into him in his final over. Kaul gave away 20 runs in the penultimate over of the innings including three sixes, with one of them coming off a free-hit. Kaul was a crucial bowler in the death overs alongside Bhuvneshwar Kumar for Sunrisers in the last two seasons. He had picked up 16 and 21 wickets in 2017 and 2018 respectively but had gone at 8.41 and 8.28 runs per over. He was the eleventh highest wicket-taker in 2017 but finished joint second with teammate Rashid Khan last year with 21 wickets. 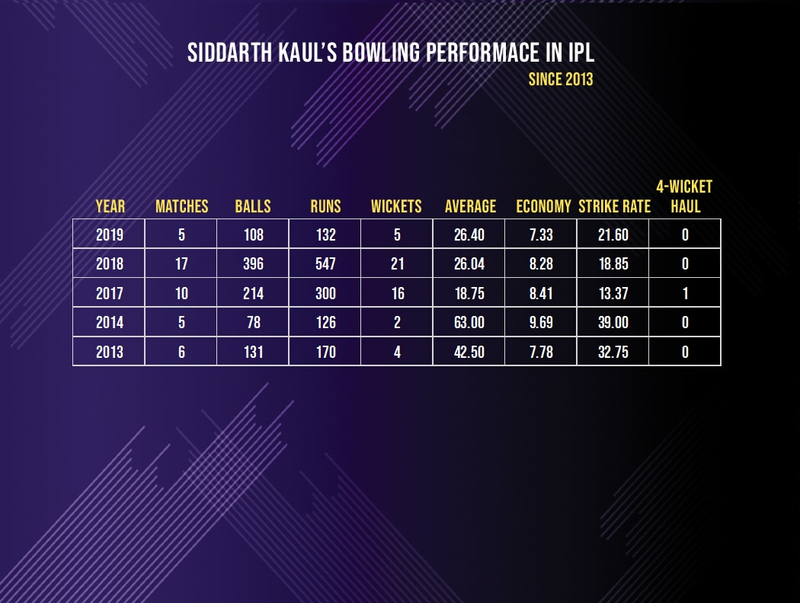 This year, in the first five matches, Kaul has picked up just five wickets but importantly has a good economy. He has gone for just 7.33 runs per over although he has gone wicketless in two out of five matches. First used as a death bowler in 2017 by Warner, Kaul's strengths with the old ball stand in his favour. He had impressed with the old ball in the Irani Cup and Ranji Trophy and the SRH think-tank used him in the death overs in the practice games in 2017. His biggest weapon in the death is his knuckle ball which he first picked up from watching Zaheer Khan. Kaul has been trying to nail his yorkers but has come apart the last few times. In the T20I against Australia, he conceded a six and a four to Maxwell with Australia needing 9 to win in an over. This season with SRH, he has conceded 39 runs in the three overs he has bowled after 16 overs. Last game, Axar Patel hit him for two sixes, both off slower length balls. Tonight, he was dumped for three sixes with one being a slower delivery and the two others being low full tosses. He has found better success when he goes wider and nails his yorkers but the knuckle balls and slower balls are coming apart. Sunrisers need the Kaul of old to step up, especially with Bhuvneshwar Kumar leaking runs in the death of late. His initial efforts in the game were commendable but his spell got derailed in the death yet again.